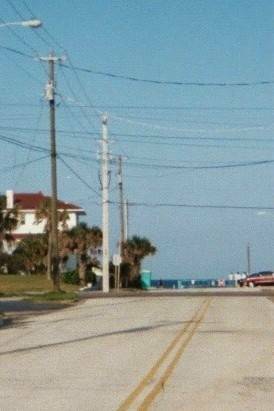 Daytona Beach Vacation Home 100 Yard from Beach!!! 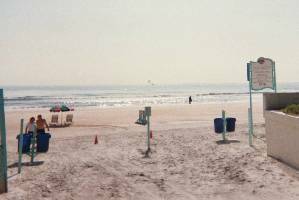 FAMOUS BEACH - DAYTONA BEACH! Beautiful turnkey beach house with limited oceanview. DVR WITH ENHANCED CABLE - NEW LCD TVs!!!! AS WELL AS CRIB AND HIGHCHAIRS. cooler, beach cart, beach bag, etc. major grocery stores are located within two miles!!! maintained and current! Beautifully decorated! updated and improved to stay fresh and exciting! Mid Week cleaning service can be arranged. RENOVATED AND READY FOR YOU! - home to NASCAR DAYTONA 500, PEPSI 400, BUSCH and 24 Hours of Daytona. Located 6 miles from Speedway. Great Motorcycle events include Bike Weeks in March and Biketoberfest in October. Located 1/2 mile south of Main St.
Turkey Rod Run in November for antique car enthusiasts. 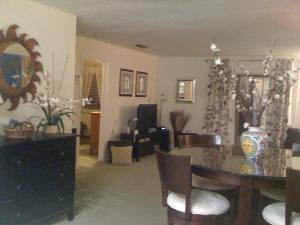 Located 3 miles from Bellair Plaza. Two minute walk from front door to this beach. 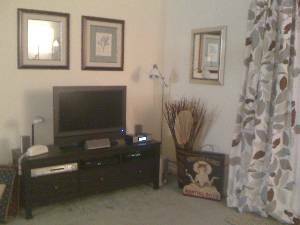 Newly Furnished 2011 including LCD TVs! Welcome to the "World's Most Famous Beach" - this is the beach 100 yards from front door! Brand New 12/2011 Family room furniture! Highend comfortable sleeper! Photo taken from driveway looking east to beach. Less than 1/2 block! Easy two minute walk to ocean's edge. Lenox Avenue deadends here at the beach! 100 yards from front door. So close. Our family stayed at the Sea Orchid Beach House for two weeks over the 2008 Christmas break. It was absolutely perfect. We have two teenagers, plus our older son's family vacationed with us as well. 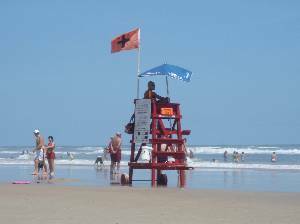 There is so much to do right in the Daytona area, plus other attractions are only about an hour away. The home itself is beautiful and has everything you need for an extended stay. We had a great time and will definitely stay here again. The #1 place to rent. All amendities are at your fingertips, great for beach lovers, kids (games, beach toys, movies) and adults! So comfortable it is a home away from home! 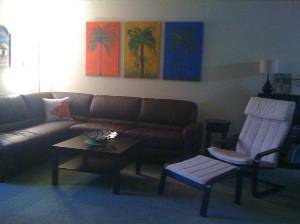 Clean and spacious, so much to do or just relax... Great neighborhood, walk to beach, convenient to all Daytona fun spots and shopping! Everything you need for a wonderful vacation is in this home! Rooms are decorated with extra little homey touches, yet home feels so open and airy... promise you will be a return renter! We had a wonderful time staying at the house, found it to be as advertised. We will keep you in mind if we ever plan another trip to Daytona Beach. We enjoyed the beach house very much. I was very impressed as to all of the amenities the house had. I really didn't see anything that could or should be changed! The beach house was beautiful and fit our needs perfectly. The house was great, plenty of room for all of us (4 adults/5 kids). The master bedroom worked out great, we could put all the kids in there. There really isn't anything we would change, it was very "homey" and everything that we needed was there. We did use the beach toys, towels and chairs frequently and it was nice to have the washer and dryer. We loved the place and hope to return soon. Domenick and Tina were very friendly and nice and greeted us each time they saw us. Tina gave us some tips on the sights! Thanks for a Great House and we had a wonderful vacation. The time was too short! We did come home with a National Championship! So everything went great. 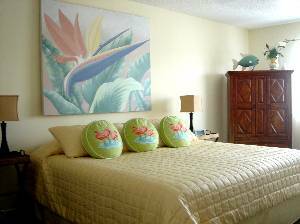 L. Dhawan - 9-06: Being at the Sea Orchid Beach House was a truly wonderful experience. It was nice, cozy, clean and comfortable. Very tastefully decorated and complete. It just felt like our own home! Whatever you could think of was available. We LOVED the Sea Orchid. The sheets, comforters and towels were very clean and plenty. The kids and adults enjoyed beach toys and beach chairs and mats. We sure did enjoy every bit of it. If we ever get a chance to come back to Daytona Beach we would love to stay here again. thank you for everything, Debra. You have wonderful taste and we loved your house. C. Hudgins - 7-06: We Loved the Sea Orchid! It was soooo nice and pretty and CLEAN!! My mom and sister just raved on and on how nice and clean it was. It smelled very good too! Whoever cleans it up surely does a fantastic job. Your sheets and towels were to die for! I though we were at the Ritz-Carlton. The first night when I crawled in that kingsized bed I was in heaven. We sure did enjoy everything. We loved your decorating also. It was just nice. My sister and I hardly wanted to go anywhere but stay there and rest and enjoy everything. If we ever get a chance to come back to Daytona Beach, we sure would love to stay there again. Thank you for everything and I love your house! J.D.Bower - 6-06: This was a great experience for us. Much better than a hotel. We had 3 couples and a baby and never felt crowded. Everything was furnished that we could need. J. Oldham - 3-07: We had the most wonderful time in this home. It was so clean and refreshing. When I walked in the door, I felt so at home. Other places I've stayed have been nice, but I've never felt as comfortable as I did here. I didn't feel like a guest who had just unpacked for a week; I felt like I had always lived there. I hope we will return to Daytona in the future. One thing is for sure, I will return only if I can stay here! Nothing else could ever measure up. G. Tenharmsel - 2-07: We stayed for Daytona Race Week. Very nice place. 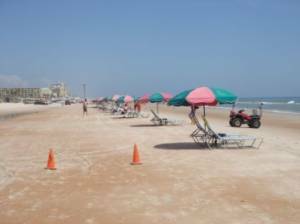 Very inviting, very clean and great for beach, Daytona and just getting around the area. We hope to stay there again. D. Whituss - 1-07: Thank you very much for letting us stay at your home. We had a wonderful time and your house has all the conveniences of home. I really appreciate your promptness in returning the security deposit. Special dates/events are priced accordingly. Please inquire. Rates subject to change without prior notice. Please inquire. Discounts for repeat guests! Discounts considered for extended stays. Deposit: Security Deposit $350 - $500 depending upon size of party. Cancellations and Refunds: Cancellations made prior to 90 days of arrival will be refunded, less $100 administration fee. No refund for cancellations 30 days or less prior to arrival. Cancellations 30-90 prior to arrival refunded if another equal rental is secured, subject to $250 cancellation fee. All effort will be made to secure another reservation but no guarantees are implied. No refunds for cancellations of special events.